Why I Am Determined To Live EVERYDAY Like It Will Be My Last………..
Work Harder. Go faster. Be MORE successful. Get Married. Have children. Aim for wealth. Travel More. Forgive. Let Go. Follow Trends. Start a Business. Buy a House. Do this DO that. Blah Blah Blah. Those are some of the things we hear on a daily. I mean let’s be honest. It is indeed Motivating to see people living their lives, chasing their dreams just trying to be GREAT. It is also even better when it’s YOU who is chasing them as well. However there comes a time when you have to ask yourself are you doing all of that because it’s who you really want to be, or better yet who you are really supposed to be, or are you just doing all those things because that’s what is expected by the people around you, society’s standards, or just plain fear of being rejected by people or places because your status isn’t “Good” Enough? It’s no secret to many that I like many other women am a very ambitious person. I mean I get extremely “High” persay on the excitement of being successful at something I’ve set out to do, whether it be film, books, audio series, documentaries, daily inspiration etc. I mean who need’s drugs when you are living a life you love! And as great as all this is, sometimes you have to take a second to reflect and ask yourself, what is it all worth? What is the real purpose? And why do I care so much about other’s perception of what I do. I realized a lot of the ambition and desire to succeed, comes from a fear of failure. But on whose standards? Who gets to say what failure is and what characterizes it?. Well I have been doing alot of soul-searching, and I have come to the realization, that We are all gifted with many gifts, often times it’s the very things we think are normal about ourselves, or the things that we hate the most about ourselves, that are meant for a bigger purpose. I use to talk alot. I mean I lived for a good debate. Ha. Not because I love to argue, but because I love the preparation part. I love the fact that I make sure to have my facts about whatever I’m discussing, I know how to include my Personal views, without allowing them to consume the total debate, ( I mean its the worst being called emotional right?) But as i get older I realize, that is my gift. Im a very passionate person, I love to help people. I love knowledge. Reading, writing, I know that is my soul purpose. It helps me express things in ways i may have a hard time saying at first. 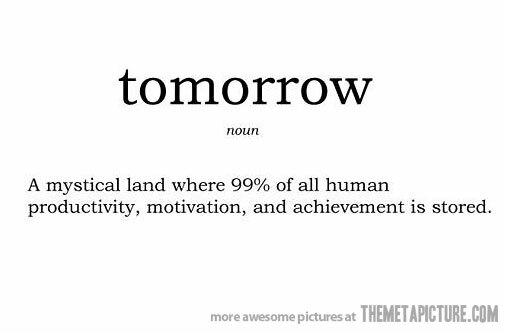 However I cant help but look at how comfortable we as a society have become with the thought of “Tomorrow”. I often say, Oh I will write that tomorrow, I’ll call them tomorrow, oh I will release that next month or next year,etc! I mean don’t get me wrong, Its nothing wrong with setting goals and preparation for what’s next, as a matter of fact it’s necessary, You have to be ambitious and extremely passionate about being successful in life. Not because of the pressures of whats around you , but in-spite of them. But I grew concerned when I realized how selfish of us to think that we are promised another day. It had me questioning, what am I working this hard for and not enjoying or grasping in the current moments. What Good is it for everyone to enjoy your seeds you sow, yet you have yet to mask in the moment? None. It’s not worth it at all. So many people never really get to see how much they mean to the people around them, or get to understand just how amazing they truly are. We focus so much on the negativity, the money, the fame, the approval and applause from other’s yet we don’t ever do those things for ourselves. Which leaves us fighting this battle for approval when we are the one’s who would truly control how we feel about ourselvess. So I decided a while ago, that I would focus on my soul happiness, I will build up the courage to be my first priority. Now trust me when I tell you, It seems really easy when It’s said but it’s not. I had to learn how to be still. Patient. And know that I am enough. If I don’t achieve anything else, If I don’t meet another extraordinary person, If I don’t make another Dollar, I AM ENOUGH. When you come to this realization things seem to come into a different perspective and It did however totally opposite of what people would think. See reading this you may think, aw man this will make you egotistical and not a very happy person overall, I mean who in the world wants to live a life where nothing matters but them right? Well here is the thing, when you love yourself so much, and embrace who you are, that love you feel and passion you feel will become overflow. You will want nothing more but to share it with the world. You attract better people around you, those who want to feed into your spirit and happiness. You become a better person overall. When you realize that today is all that counts. This very moment is all you are promised. With life happening so fast, so many things we want to accomplish, people we want to meet, places we want to go, so on and so forth, we forget that Tomorrow for many wont come, and one day that will be us. If we spend so much time preparing for tomorrow and never taking the time to be grateful and thankful for what we have achieved this for we will miss the most important thing, Life in the Moment. I have met so many wealthy people and I have met many who were not happy unless they had that wealth, and then I have met many who realize their happiness doesn’t come from the things at all, it comes with the ability to be happy with the person you wake up with everyday. Yourself. The things just enhance what is already there. So many are defined by who defines them. If you ask them who are they, they name the accomplishments, the people they know, the money they make, the titles the possess, whether its a mom, wife, husband, dad, sister, friend, CEO, president, chair holder, singer, artist, dancer etc so on. BUT those things are NOT who you are, those are things you accomplish and the positions you play. Who you are is based on your inwardness, Who do you see yourself as? So I made the decision, I will strengthen my sense of appreciation for myself. Loving and adoring myself no matter who is in my life, what things I accomplish etc, because that is how I am able to inspire so many people, help change so many people’s lives, create amazing work, and be who I am as a woman in general, By truly loving myself in spite of what I may think my flaws are. You see other’s perception of you , good or bad, should not affect the way you see yourself. There should be a certain level of security invested deep within that no one can touch or compare to. If you don’t have that it will show, in your lack of confidence, through your work, your artistry, your parenting, your ability to not sustain meaningful relationships and your fear of success. Yes fear of success. So many people say they want it, they work every day towards it, yet when it comes close to getting what they have sown for so long, they panic, they become anxious, and fearful of the what if’s and give up. DON’T LET THAT BE YOU. Don’t be afraid of what you already possess. You are full of greatness, and so often we don’t see it until someone else points it out for us. You should know that when you are unhappy with your life, it comes from you not being happy with yourself, Your bitterness with people and your enviousness towards their success, their happiness, and life overall comes from you not being happy with you. You can’t appreciate other’s, you don’t have many women friends because you are not connected and in tune with yourself. Life is so short, and whether we embrace that are not, even if you live 100 years it still will be short to those who love and value you most. Don’t put off on tomorrow, what you should do today. Love, Live, be happy, laugh, make love, hug someone, kiss, and be grateful. Express gratitude for every second, Do something you have never done, try new foods, meet new people, make the most out of each day, because the journey is what counts, not the destination. I don’t think people understand that we are so eager to get to the destination ” Success” that once you reach it only a few things will happen, when you reach a destination that signifies the end. So you will either die, fall from the top, or allow greed to prevent you from sustaining it. But that little saying” What goes up must come down” is true in a sense. So I keep that in mind on my RUSH to success. I just want to enjoy the journey and reap the benefits of my hard work while enjoying each moment as it comes. Should you set goals? YOU BETTER. Should you work hard at achieving them. NO OTHER OPTION. But don’t forget that life happens every moment and if you are to focused on what’s to come , oppose to what’s currently happening, you will miss the very moments that mean the most and that are mostly imperative to the journey ahead. My Goal in life is for the seeds I’ve sewn to out live me, for people to read my books, years after I’m gone, for people to quote me, and listen to my audio for encouragement, visit my blog, watch my documentaries and even more remember the feeling I gave them with my presence. That is what matters the most. Quality living Verses the Quantity of existing. Live Life Like there is NO tomorrow, that way you LIVE and NOT EXIST everyday.